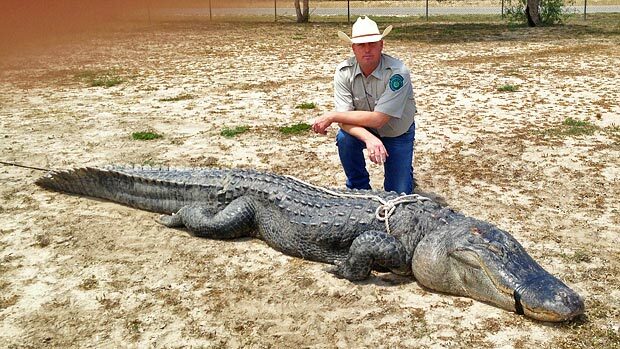 AUSTIN, Texas – A young hunter who grew up with a fascination about dinosaurs and a dream of hunting what some call “living dinosaurs” has harvested the largest alligator ever certified in Texas. Braxton Bielski, an 18-year-old high school senior on his first alligator hunt, bagged the behemoth 800-pound, 14-foot, 3-inch gator during a recent public hunt on the James E. Daughtrey Wildlife Management Area. Braxton and his father, Troy Bielski, were among 481 applicants vying for 10 alligator permits issued through the Texas Parks and Wildlife Department’s public hunting program for a five-day hunt at the Daughtrey WMA. 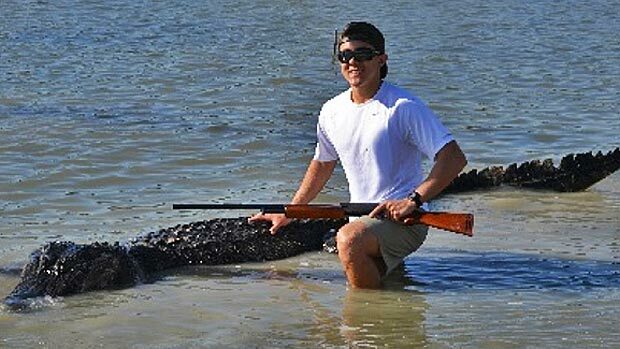 Braxton Bielski, 18, killed the Texas record alligator. The coveted permit provides the only opportunity to hunt and harvest an alligator on Choke Canyon Reservoir, situated within the Daughtrey WMA boundary. Each year, TPWD’s public hunting program provides access to some of the state’s high-quality managed wildlife habitat to about 5,500 hunters selected through random computer drawings. Wildlife management areas, state parks and leased private property are available for these supervised hunts for a variety of game, including: white-tailed deer, mule deer, pronghorn, javelina, alligator, exotics, feral hog and spring turkey. Through an application process, hunters select from 29 different hunt categories, including eight specifically for youth only, and choose a preferred hunt date and location from hunt areas stretching across the state. There’s even a provision for hunting buddies to apply as a group — in some cases up to four hunters can apply together on one application. This season TPWD processed 998 applications for 2,340 hopeful applicants in the alligator hunt category. The department offered 165 permits to go alligator hunting on five WMAs (Angelina Neches/Dam B, James Daughtrey, Guadalupe Delta, Mad Island, and J.D. Murphree). Because alligator hunting in Texas is conservatively managed, most hunters selected for these public hunts are first-timers and many have never seen an alligator in the wild. For that reason, TPWD biologists go through an intensive orientation process and provide greater guidance than they would for more common hunts, like for deer or waterfowl. Troy said he knew some about the area they would be hunting, having done some bass fishing on Choke Canyon years ago, but with current low water levels, the landscape was completely different from what he remembered. “We spent a lot of time scouting some of the pastures in the compartment we were assigned, looking for likely spots to set our lines,” Troy said. At one point, the pair observed what they believed to be a large gator in a cove and decided to place their baited lines nearby. “We didn’t pressure it, but while we were putting up our cane poles we could see it watching us 30 yards away,” Braxton said. A Texas wildlife officer checks out Braxton Bielski's record gator. (Courtesy Texas Parks and Wildlife). Choke Canyon has a reputation for holding some big old gators. Unlike the alligator populations along their core range in southeast Texas, these creatures are left alone to live to a ripe old age. A 14-footer is estimated to be between 30-50 years old, according to TPWD alligator program leader Amos Cooper. In the five years TPWD has hunted gators on the Daughtrey WMA, several huge specimens have been harvested, including two in 2011 measuring over 13-feet and another in that size class last year. Living in Fort Bend County, Troy and his son routinely saw alligators while jogging but being able to judge their size was tough. Braxton chose one of the lines as his set; the other would be his dad’s. When the two hunters returned the next morning, they realized they had their work cut out as both lines were down indicating they had two alligators hooked. A hook and line set baited with raw meat is used to catch the alligator; only after it has been hooked can a gator be dispatched at close range with a firearm. They weren’t the only ones having a successful first day. All the hunters participating in the hunt had landed gators, which proved equally challenging for the WMA staff. Troy’s gator turned out to be a huge female measuring 10 ½ feet long, which, as it turned out was dwarfed by his son’s catch. More information about TPWD’s public hunting program and the application process for special drawing hunts is available online at //www.tpwd.state.tx.us/huntwild/hunt/public/.